One of the many options you have at the end of your official GMAT is to cancel your score. As with everything else associated with the GMAT, it is a very good idea to think this through strategically and thoroughly, so that you are already in a good position to decide when you are presented with the choice. In the past, folks would get to the end of their GMAT, and then, totally sapped of energy at the end of that test, the computer would ask them: do you want to cancel your score? People had to make that decision in the dark, with no objective idea of what their score was. In my mind, that bordered on cruel and unusual punishment! Fortunately, GMAC seems to have relented. In a recent announcement, GMAC announced that students will be able to see their GMAT score before they are asked whether they want to cancel the GMAT score. This is a big change, and I believe it is very much a change for the better. You will still be completely exhausted and tapped out when the computer asks you about this, but at least you will know your score. 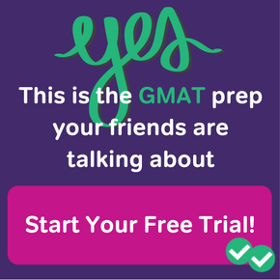 If you don’t cancel your GMAT score at the test center, and then change your mind, then within 72 hours you can cancel your score at mba.com for a $25 fee. If you do cancel your GMAT score at the test center, and then change your mind, you can ask GMAC to reinstate your score within 60 days. It will cost you another $100. Have you ever heard the lottery called “a tax on people bad at math”? I think these fees are very similar. These GMAC fees are a tax on people who are particularly unstrategic, on folks who are not prepared to make sound decisions. Don’t let that be you. Have a clear plan worked out beforehand. Whether you are taking the GMAT for the first time or are retaking it, part of your practice should involve extensive practice testing. Save the high quality practice tests for later in your practice. Many folks make the mistake of using GMAT Prep right at the beginning, and thus having nothing high quality remaining at the end. You should take a relative low quality practice test right at the beginning of your studying, to get a rough idea of your cold starting point. You should take several practice tests during your studying, as our study schedules suggest. The MGMAT CATs and the Magoosh practice tests are high quality: save those until later in your studying, and save the official material, the GMAT Prep, until right before the test. Understand that it’s quite ordinary to see a drop from your practice test to the real GMAT. Very few people can duplicate practice test scores on the real GMAT. You see, no matter how “real” you make your practice, your brain simply knows: this isn’t for real. Any mistakes you make on the practice test are private failures: they may disappoint you, but no one else has to know about them. On the real GMAT, every part of your central nervous system knows: this is for real. Unless you have done months of significant stress management work, the stress of the real test situation will inevitably lower your score a bit. It is important to expect this and plan for it, not to be surprised and disappointed by it. This means, you have to be judicious when you are planning a retake. Suppose you get 640 on your first GMAT. If in your studying you take practice tests and score 670, 680, even 690, don’t automatically assume this will mean you will significantly exceed your first GMAT score when you sit for the retake. Once again, very few people can do as well on the real thing as they do in their private practice sessions. You shouldn’t consider sitting for a retake unless you are scoring consistently 50+ above your previous score in your practice. You really need to be rocking the GMAT compared to your previous score. That’s the proper conditions for a retake. In the vast majority of cases, I would say, the answer is a clear no. This is very important: disappointment in the moment is NOT a valid reason for canceling your score. It is crucial that you go into the GMAT with a strategic plan. In general, I think that you should seriously consider canceling your score only if something wildly unexpected takes place: for example, if you were healthy on your way to the test center, but during the test, you were hit with, say, a bout of food poisoning or something of that sort. In other words, if something out-of-the-blue interrupts your test performance, such that your performance that day is a clear aberration from anyone’s normal test-taking experience, that’s a sound reason to cancel. That should be rare. 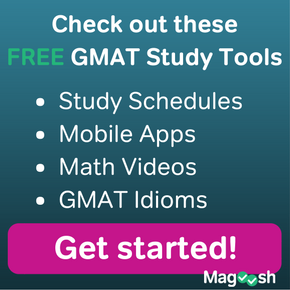 Should you cancel your GMAT for a low score? In general, I would answer: no. If you are taking the GMAT for the first time, then a low score that time will mean you will retake anyway, and remember that a BIG jump between a low score on the first test and high score on the retake could be very impressive to adcom: look where I started and look how much I improved. There is very little reason to cancel the score of a first-time GMAT. What if you are retaking? Well, of course, if you have done your work with practice tests, you should have a good rough idea of what kind of score to expect on the retake. You definitely need to have a target score for canceling worked out well before you walk into the test. Talk to a professor. Talk to an admission consultant. Know what the average GMAT score is for the program you want to attend (this infographic might help). Make a highly informed decision well before your ever set foot into the test room. If I score below X, I will cancel my score. That should be decided and non-negotiable before you walk into the room. Of course, you have absolutely no business sitting for the GMAT if it is at all likely that you will perform anywhere near the level that would involve a score cancellation. Suppose your first score is 640, and you decide you will cancel for anything 650 or below on the retake: well, you have no business even scheduling a retake until you can consistently break 700 in all your practice tests. That is part of being strategic: you need to hold yourself to a very high standard. Winston Churchill said: “The price of greatness is responsibility.” If you want to be successful on the GMAT, in your business career, and in your life as a whole, you need to take deep responsibility for yourself and for the consequences of your actions. Part of this means being as prepared as possible, and consciously thinking through an intelligent response to a wide variety of circumstances beforehand. In my view, it would be the height of irresponsibility to get to that screen at the end of the GMAT, asking whether you want to cancel your score, and to think about the issue there and then for the first time. By the time you get to that screen, everything about the decision should be made already. If you would like to share any of your own experiences with score cancellation on the GMAT, please let us know in the comments section. If I re-take gmat and score same or lower, could I cancel the score at the spot so that my previous score is still valid?? Basically, what interests me the most is if my previous result would be valid in case I cancel the re-take score. I took the GMAT test and got 440 with quant 42 and verbal 14 and I didn’t cancel my score .I will be retaking the exam anyways in a couple of months.Will the old score affect my application ?? I am in a similar situation. Naively I took the Gmat as a test drive last year without any knowledge on the noncancellation policy. Now it is too late for me to cancel. My score is 440 too. Although i checked that all my target programs only look at highest score, im still concerned. Do u know if the adcoms adhere strictly to what they preach? Does in any case, lower past score (400plus! Gasp!) still reflect badly, especially when faced with such tight competition where the adcom needs any excuse to cherrypick? Or is this a really black and white criteria? I want to repeat it but I am confused. How to study & what to do? I scored badly bec I was pretty nervous at Quantitative & couldn’t focus at all. For Verbal, I did what I could. No regrets. I’m glad you wrote in. We can help! 🙂 First of all, I’d recommend checking out this post about overcoming exam anxiety. Mike has some great recommendations in there. Secondly, I’d recommend using one of our study plans. This plan is math-focused and could be a great place to start! The article is very interesting and could have been helpful… if only I had read it before retaking the GMAT exam the second time. I scored 640 in both the exams. I know I can do much better than that, but considering that even after spending a couple of months for preparation and scoring around 680 – 690 in practice tests, I ended up getting the same score again. I accepted the score both the times and now the colleges already know that there wasn’t any improvement when appearing for the second time. How bad an impression is that for colleges? I have my applications due dates soon now. But I am not able to decide whether to go ahead and spend the time giving gmat again or preparing for applications. My Profile is also not very impressive, with a very regular, and this was the primary reason I was wanting to score better on GMAT. Let me know you opinion. I believe I have taken a wrong decision and should re instate my score. May be I was expecting a 650+ as I studies hard but them improvement is improvement. What do you suggest? I have a very few days left to do that. 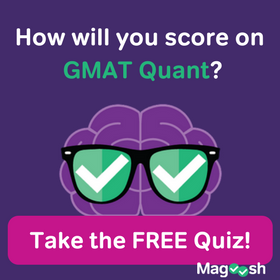 Here’s the question you need to decide: Are you done taking the GMAT? In other words, if you uncancelled that score, would you use it and be done with the GMAT? Is this a score with which you are happy, and that you feel adequately represents your abilities and potential? You have to go with a gut answer here. If your answer is: I am totally 100% satisfied with sending b-schools this 590. I am completely happy if they use that GMAT score to judge me. I am confident that I can get accepted at some of the schools I desire with this GMAT. I just want to be done with the GMAT. If that is your position, then that’s fine. Uncancel the score, send it to B-schools, and be done with the GMAT. If your answer is: I am NOT satisfied with this 590! I know I can do better! I have to take the GMAT again, because I don’t want adcom to judge me on the basis of this 590! Well, if that is your answer, then you will be taking the GMAT again, so there is absolutely no reason to reinstate that particular score: you are going to blow it out of the water on your next retake. My friend, don’t think about this. Get out of your head. Get out of the stew of whirling thoughts. Take some slow deep breaths. You need to feel into your core, feel into your deeper self. Feel you heart. Feel your gut. This is a decision that must come from the essence of who you are. Does the 590 adequately reflect you abilities and potential? Yes or no. Everything follows clearly from the simple answer to that question. Among other things, some of those articles will help you with this decision. My friend, I wish you the very best of good luck in your future! Thank You Mike for the reply. I’m not at all happy with a 590. That is for sure. And I am retaking the test soon. But I have a question that’s bothering me for long. Though I had a 40 mark improvement from 550 to a 590, don’t you think I should reflect that on my GMAT reports. As I have cancelled my retake score (a 590) won’t the adcom feel what WRONG has happened with this guy that he has to cancel his score. After all an improvement is an improvement. First of all, my friend, I would say: set your sights high for this next retake. I would say: don’t even dare to walk into that testing room unless you are going to score above 650. If you have a big increase next time around, you won’t have anything to explain to adcom: they simply will be impressed. So what if you cancelled something? As long as you produced an impressive result in the end, the details of your path are less important. If you are planning on only a mediocre increase the next time around, and see yourself as having to do a lot of explaining and justifying, then yes, you may need that 590 score to show — each time, a modest improvement. It’s useful if you are planning to have to rely on self-justification, but do you see the self-defeating mindset involved in making such a plan? Do you want to hedge your bets, accounting for mediocrity, or do you want to commit yourself wholeheartedly and unreservedly to excellence? This is a decision that should inform every single moment you spend in preparation. Don’t you see? If you leave that score cancelled, then there’s a kind of “burn your bridges behind you” risk to what you are taking, and that will necessitate your excellence in the future. You won’t leave yourself any choice but to be excellent, to strive to the very utmost of your abilities. Some folks need that kind of self-ultimatum to feel motivated. The only true advantage of reviving the 590 is if you join Magoosh. Magoosh has a 50-point money-back score guarantee, and we would base that off of your highest pre-Magoosh score, so if you revive the 590, then Magoosh would guarantee at least 640 on the next time around. Many students increase more than 50 points. Again, if you cross 650, then the previous GMATs don’t matter nearly as much. Impressive in the end: that’s what adcom wants to see. I took the test recently and scored a 670. Thank You for the useful tips and your never ending support at a time when I almost freaked out over my decision to whether reinstate my scores. Your advise throughout has been unmatched. I just love the way you write. Almost all of the articles have been bookmarked by me. My journey with GMAT is still not over. I’d be taking my last shot at it in a few days from now. Just wanted to thank you ! I’ll make sure Mike sees this! 🙂 Best of luck on your final GMAT exam! You got this! I have a question for the GMAT score cancelation policy. Does GMAC leaves some record in my official score report, if I reinstate the score after cancelation? Or official score report say nothing in this reinstate case…..? I’m happy to respond 🙂 and I will respond in two ways. First of all, as to the literal question, I don’t know for sure, but if you were to reinstate a cancelled score, I find it hard to imagine that the score report would contain anything other than the GMAT score for that particular day. If GMAC would to include a gratuitous note that the score was canceled and reinstated, that would be mean-spirited in a nitpicky way that is not really characteristic of them That’s my best guess. Much more important, I would say: why are you asking? Why on earth are you asking this question? Having any plan in the back of your mind of cancelling then reinstating means that you are not clear with yourself. To thrive in the modern business world, you need the ability to make confident decisions, under difficult and confusing circumstances, and not second-guess yourself needlessly. You need to be rock-solid in your clarity and determination. Ideally, you would not let yourself walk into the GMAT until you know that you can totally own it. Failing that level of confidence, you should walk into the GMAT with a crystal clear, ultra-precise idea of exactly what score-threshold will cause you to cancel your score. Make this decision well before the GMAT, stick with it, and don’t look back. If you construct a plan that has escape-hatches built in, that is a telltale sign that you don’t believe yourself, your talents, and your ability to achieve success. If you give credence to this lack of belief, this will defeat you. My friend, have confidence. Believe in yourself. Align with your deep sense of purpose. Make your plan, commit to it, and stick to it with unwavering conviction. That is the stuff of success, and that is precisely what I wish you. Thanks for the great article. I have few questions on the same. I scored a 680(q 47 v 36 ir 4 awa 5.5) on my first attempt. I decided to retake the exam to increase it further but the score dropped and i cancelled my scores. I however donot want to retake the exam if it can be avoided…Will this reflect poorly on my profile since my final attempt is a cancelled score? You are quite welcome. Will this reflect poorly? Well, it’s not ideal, but it all depends on how you spin it. If you present yourself as a person who has a lot for which to apologize, that’s not particular appealing to anyone. Stand in your confidence and present your strengths. First off – thanks a lot for all blogs- I literally look for your answers whenever a GMAT-related question pops up in my head! I am taking the GMAT this Saturday – I have been averaging at 720 with my mock test scores. I definitely want a 700+ score on the day of – not sure if I am going to make it! In either case, I am looking at this as a positive experience and a way to understand how the real GMAT is administered (lest I have to take it again!). I have decided, as of now, to reject any score under 680. If I do have to retake the exam, I will do it in the next 45 days – so I am unsure of the ‘jump’ that I might be able to represent in my second test. I mean, going from a 670 to a 710 is not a big deal for ad-coms right? Would you say this is the right thing to do? Or does it look extra suspicious to see a ‘non-reported’ score? Let me know what you think. Thanks Mike! Thanks for your prompt reply, Mike! You’ve thrown me a CR inference question right here 😉 Are you suggesting that if I am to cancel my score for this test, my next official score will NOT show that I have taken the GMAT once before? I totally understand your 670 to 710 point, and I will keep that in mind for sure. Finally, I had a quick question about the mock tests. Are the mock tests easier in content as compared to the actual GMAT? I can completely relate to the stress and anxiety bringing down a score – just wondering how realistic the question difficulty is on the GMAT Prep tests. Yes, if you cancel your GMAT score, it disappears. All evidence that it ever happened is consigned to oblivion — if you take the GMAT again and get a score report, it is as if you never even took the test for which you canceled the score. Are you familiar with the idea of an un-person in George Orwell’s novel 1984? Your canceled score is, in that sense, an un-score: if at any point in the future, you try to refer to that particular GMAT performance, the only response any official group could possibly give you is: “What GMAT performance? You didn’t take the GMAT that day!” The only way that adcom could possibly know that you sat for the GMAT that time and canceled your score would be if you explicitly told them — which, of course, is not a recommended strategy for admission! Thank you for your kind words, my friend, and I wish you the best of luck. This is a brilliant reply – thanks so much Mike. I will try my best to stay calm and positive on Saturday. Again, your help and guidance (knowingly and unknowingly) has been stellar – thanks a TON! You are quite welcome, my friend. 🙂 I wish you the verb best of good fortune on Saturday. I’ve read on MBA.com that the fact that the scores were cancelled will be mentioned in the official score reports sent to schools. So if I got a score lower than my first attempt and cancelled it, the fact that I cancelled my score will still be a blot when I report my older score? I’m happy to respond. 🙂 On this page, GMAC says, “If you have taken the exam and canceled your scores, your report will note that scores are unreportable.” In other words, it sounds as if the official score report will say that on such-and-such a day you sat for the GMAT, but with no information about the score. Adcom will know that you sat for the GMAT that day, but it will not know anything about your score that day or even whether you completed the test. It’s true, this might raise some questions, and certainly multiple cancellations would raise some serious red flags. If you have a low score, then a cancellation, then a high score, that certainly can be spun as a successful story, but you will have to address it consciously, and not simply hope that no one will notice. They will. I have taken the GMAT 3 times. I cancelled my score the 2nd time (taken on 24th June) as it was rather low. I retook the GMAT for the 3rd time (on 29th July) and chose to publish the score. When I received the official score report after the 3rd attempt, I saw a “C” against all sections of the GMAT taken on 2nd attempt. I thought GMAT would not show a “C” against cancelled tests even for tests taken prior to the revised policy effective from July 19th. This came as a big of a surprise to me. Will this change be applied retroactively to scores cancelled prior to July 19? 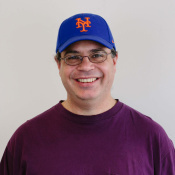 The removal of the “C” on score reports will be “retroactively” applied. Any score cancellations done prior to July 19, 2015 will not be included in score reports sent to schools after July 19, 2015. I think you should write to them and ask for the same. Surely, you’ll see something on the positive side. Great article! This information was much needed. Here’s a time I should have cancelled my score. The day of the test arrived. I could only take a half day off work, so I scheduled the test for 7:30 AM, first test of the day. The proctor handed me the rules of the testing center and I turned around to read them. BUT standing behind me in line was a CONJOINED TWIN! One body. Two heads. Two people (I found out later). I tried to not stare, but come on, how often do you see conjoined twins?! Apparently one of them was taking an elementary education certification test. I tried to compose myself and go in and take the test. However, I could NOT, for the life of me, focus on the test. I had never met nor hardly even thought of conjoined twins, so this concept was mind-boggling to me. Questions ranging from sleeping to dating to driving to bowel movements started running through my mind and, unfortunately, my focus on the test went completely out the window. Needless to say, my score: 510. Not a good day, but that story has given me a lot of traction in B-school, not many people can top it. Thanks for a fantastic story! That’s a great example of how out-of-the-ordinary things have to be to make one decide to cancel one’s score! Thanks, and best of luck to you!